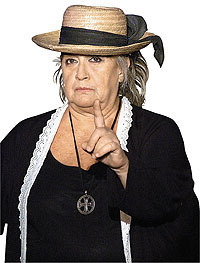 On March 2, famed Georgian film and theater actress Sofiko Chiaureli died at the age of 70 after a long illness. She will be buried in the Didube pantheon near her late husband, actor Kote Mokharadze, according to the news agency NewsGeorgia. Chiaureli was awarded the title of National Artist in both Georgia and Armenia in the 1970s, as well as receiving international acclaim. She has a star in the sidewalk in front of Marjanishvili Theater, which the actress dedicated to her mother, also a famed performer. Chiaureli performed onstage at Marjanishvili Theater from 1964 until 2008. Foreign leaders offered their condolences and remembrances. “The Georgian and Armenian people’s friendship will miss her warmth, wisdom and charm,” wrote Armenian President Robert Kocharyan on March 3. Georgian actor Gia Burjanadze says Chiaureli, borne to enormously talented parents, was destined to be in a league of her own. Turning down an offer to work in Russia, she returned to Georgia and the Marjanishvili Theater. In an undated interview quoted by NewsGeorgia, Chiaureli said she had much to be pleased with in her life.